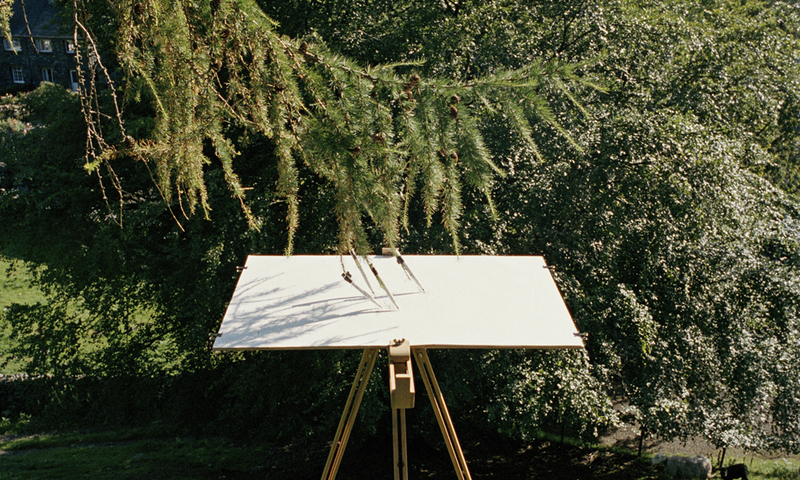 Tim Knowles, Tree Drawing – Larch on Easel #1 [4 pens]: The How, Borrowdale, Cumbria (detail), 2005, Courtesy of the artist and bitforms, NY. Tim Knowles is an internationally exhibited British artist working in all media. The three projects presented in for the Baron investigated elements of chance and randomness in nature. In his series of Tree Drawings, Knowles engages the tree as an active participant in the creative process. By attaching pens to low-hanging tree branches, the artist records a tree’s natural motions in the wind, as well as its moments of stillness. The drawings, which are presented alongside photographs that document the setup, act as signatures that reveal the unique qualities and characteristics of the tree. In the two projects developed specifically for this exhibition, Knowles explores seed dispersal methods and references the long history of environmental activism, ranging from the Diggers movement in 17th-century England to New York City’s gardening movements in the 1970s. Restorative Device #1 is a custom tailored suit that releases seeds as the artist performs his signature walks. Similarly, for Restorative Device #2, Knowles adapts a brass horn with a CO2 cartridge to launch his winged seed sculptures into the air. Both projects aim to restore plant life to vacant lots and unused urban areas. The element of randomness that Knowles instills in his seed dispersal sculptures and performances acknowledges just how difficult and unpredictable that process can be. This exhibition and Recorded Delivery, which was concurrently on view at bitforms gallery, were the artist's first two solo shows in the US.